Fomento Resorts and Hotels Limited was incorporated in the year 1971 and is engaged in the hotel business in India. Currently, the Company owns a 5 star deluxe resort "Cidade de Goa" consisting of 207 keys at Vainguinim Beach, Goa that showcase the unique Goan Portuguese architecture and ambience . The Company is currently in the process of construction and development of one 5 star upscale new hotel consisting of 299 keys at Vainguinim, Goa which is adjacent to the existing hotel Cidade de Goa. 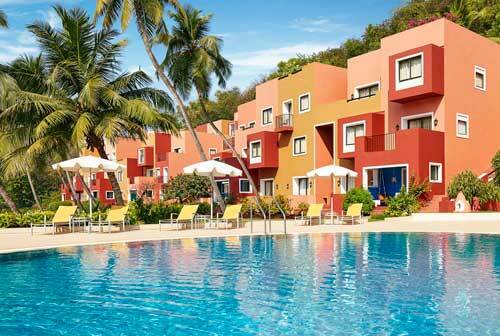 Both the New Hotel and the existing Hotel are in the vicinity of Dona Paula, Goa. The Company is also constructing a boutique 5 star resort at Aarvli, in Sindhudurg, Maharashtra.The Company is listed on Bombay Stock Exchange since 1982. Just 10 minutes from the capital city of Panjim, a leafy winding path carries you to a resort that appears like a breath of fresh air. A sprawling 40 acres haven nestled along a tranquil beach, Cidade de Goa brings to mind a quaint Portuguese village with its intimate alcoves, overhanging balcaos and vibrant murals reminiscent of a bygone era – an architectural style that earned international acclaim for its architect, Charles Correa yet within this unique kaleidoscope of Latin indulgence and Indian exuberance you’ll discover a world of welcoming hospitality. Fomento Resorts and Hotels Limited ('The Company') was incorporated in the year 1971 and is engaged in the hotel business in India. The Company owns and operates Cidade de Goa, a 5 star deluxe beach resort comprising of 207 rooms at Vainguinim beach, Goa that showcase the unique Goan Portuguese architecture and ambience. The Company's resort is family oriented providing suites, restaurants, Spa, casino, health club and other recreational activities with good conferencing and business center facilities. Un-audited Financial Results for the quarter ended June 30, 2016. Postal Ballot Notice dated February 11, 2017. Pursuant to clause 53 & 54 with the listing agreement, the Company has not entered into any contracts, agreements, MOUs or similar arrangements with media companies and / or their associates for the purpose of advertising, publicity, etc.